The vast majority of consumers—93%—prefer biometrics over passwords for authenticating payments or other financial services. This comes as no surprise, as using biometrics (think a fingerprint or iris scan) is more secure and eliminates the hassle of having to recall a password. However, while 92% of banking professionals want to adopt biometric technology, execution has been inconsistent and only 36% of relevant executives feel they have adequate experience to deliver. 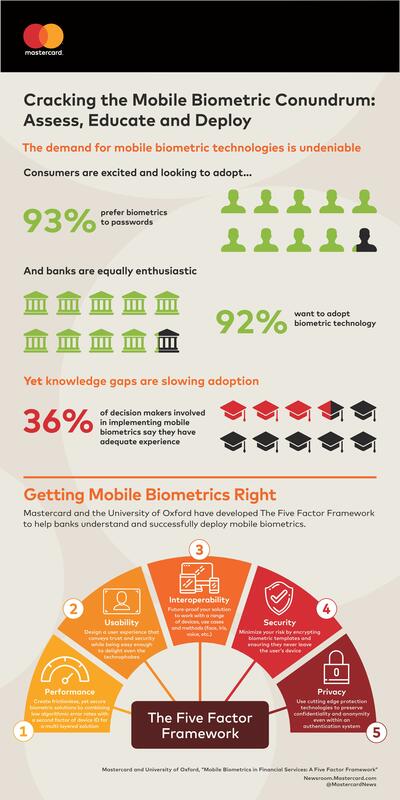 To address this challenge, Mastercard and the Department of Computer Science at the University of Oxford joined forces to explore this fast-evolving technology and develop guidelines designed to help banks understand and successfully bring mobile biometrics to life. A comprehensive research report, “Mobile Biometrics in Financial Services: A Five Factor Framework”, is now available. Considering that global sales of smartphones are expected to reach $400 billion by next year, people everywhere will increasingly have access to the tool that makes mobile biometrics possible. With initiatives like the collaboration with the University of Oxford, Mastercard is stepping up to shepherd widespread and responsible adoption of mobile biometric solutions in financial services. For more information about security at Mastercard, visit https://globalrisk.mastercard.com/.